We have all seen trends come and go. One season’s chic will be another season’s tasteless. When we are looking at renovating or building our dream homes, we don’t want to be caught with a trend that ages swiftly. The trick, it seems, is to spot the enduring, everlasting designs that will keep looking good for years to come. What Are the Fading Trends in Decorative Concrete? Moving out is the fully industrial look. Most of us don’t live in a café, restaurant or warehouse. We want something more warm, welcoming and comfortable. Wooden floating staircases meeting polished concrete floors, green, lush outdoor areas meeting patterned concrete outdoor living spaces. More and more we will see movement towards sprinkling elements of the hard, industrial materials and juxtaposing them with softer natural features. Is Polished Concrete Here to Stay? Polished concrete flooring, or even countertops, are not going anywhere. It comes down to that word timeless. Polished concrete flooring gives a raw elegance to a space, when balanced by sunlight, wood or other materials, can create breathtaking results. What are the Decorative Concrete Trends for Home Exteriors and Interiors? In response to our increasingly digital lives, we are craving more and more a tactile, human experience. 2018 will begin to see increasingly innovative measures being taken to expand how we interact with a room. No longer just sight, but temperature contrasts, lighting, roughness, detail, smoothness. All can be artfully used to engage every sense. 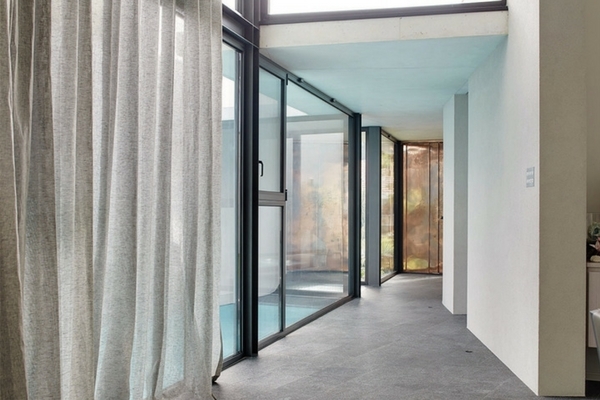 Be it exposed aggregate in concrete walls, the cool touch of polished concrete flooring, or coloured stones in a driveway, decorative concrete will be playing a big part in timeless design for all areas of the home. Tactile The grit of concrete, the grain of wood, roughness of stone. Natural sensations will be more and more incorporated to connect us with how our homes are built. Driveways For so many of us, the driveway is the first thing we see when returning home, or the immediate welcome to guests. Colours, patterns, exposed stones, or even matched lighting all contribute to a stunning entranceway. Cool Elegant, cool, straight lines. Timeless words for timeless elements. On a background of hotter summers and higher electrical bills, focus for Perth and Australia is on surfaces that retain an elegance while cooling the users of the space. Polished concrete flooring cooling your feet, stone benchtops or bathroom vanities. It will be all about the touches of cool along the touches of nature. Time for a renovation? Building your dream home? For expert advice in home design elements and all things to do with decorative concrete, contact us today!